Could not find the main class: org.codehaus.groovy.tools.GroovyStarter. Program will exit. The problem turned out to be quite simple to solve: a missing GROOVY_HOME. The packager adds the environment variable GROOVY_HOME to the shell by adding the file /etc/profile.d/groovy.sh so bash picks it up at startup via the /etc/profile script, but my current shell hadn't had a chance to read in that file yet. Share is Alfresco Software's open source collaboration server. It's a Java web application that stands as a free competitor to Microsoft SharePoint. Since I wrote earlier this month about how to modify the default footer text in the Alfresco content management server's web client, I thought I'd follow up with even simpler instructions on how to modify the global footer in Alfresco Share. You don't even need to stop and restart the web application server for this modification. The web client, which is a JavaServer Faces application, embeds the footer text inside a Java tag library inside a JAR file inside the alfresco.war file. You need the source code and a JDK to modify the global footer text. The Share web application, more simply, places its footer text inside a properties file inside the share.war file, which you can customize with a plain text editor. If you deploy Share as a WAR file instead of an exploded WAR, you'll need to unzip the WAR, edit the text file, then rezip. But that's about as complex as this change gets. Alfresco Software Inc. © 2008-2009 All rights reserved. You can see why someone might want to change this global footer text. label.copyright=Alfresco Software Inc. © 2008-2009 All rights reserved. To see your change, you can either restart your web application server if no one is using Share, or you can tell Share to refresh its web components cache without inconveniencing anyone currently using the server. Here's how. Login to Share as the "admin" user and visit the service /share/service path of the Share application. If you are running Share on your Tomcat local server, the path is probably http://localhost:8080/share/service/. This page will have a button at the bottom labeled "Refresh Web Scripts". Click it, and your footer text change should be loaded the next time the footer component script is called. Making this footer change might whet your appetite for making other customizations to your Share application. The Surf component framework makes customization fairly easy once you get the hang of how Surf works. By being able to see your changes quickly by interactively refreshing the web scripts rather than restarting the server, your feedback comes quickly. here for support. Alfresco Software Inc. © 2005-2009 All rights reserved. 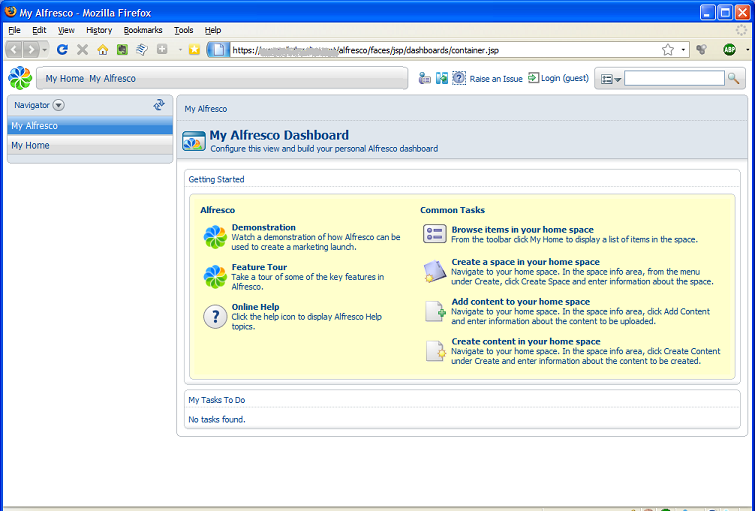 The footer includes Alfresco's logo by reading an image from the Alfresco website. This image is called a web bug, or beacon, and Alfresco can use the image request to their server to help track who is using Alfresco. The footer's underlined text links to pages on the alfresco.com website to provide warnings that the Labs version of Alfresco is not supported by Alfresco Software Inc. The right-side graphic links you to Alfresco's SourceForge download site. Except for the web beacon image, I don't fault Alfresco Software for adding the footer to its web client. Alfresco Labs is a powerful -- free -- and flexible product. If used within an organization, it is not a bad thing that users are made aware that the product is not the supported Enterprise version. However, since I am using Alfresco on an internal website, and plan to customize the various JSP pages, displaying the warning on every one of my pages seems overkill and unnecessary. And I could do without sending tracking statistics to Alfresco Software. Removing the global footer isn't a simple process, but it is pretty straightforward. The removal should be as simple as editing a globally included text file. Instead, those clever developers at Alfresco embedded the footer text into a fairly useful JSP tag. This <r:page> JSP tag outputs the skeletal HTML page tags, and includes HTML to pull in global scripts and cascading stylesheets. It also includes code that can log how long it took Alfresco to build the JSP page. To remove the footer from your web pages, you need either to stop using the r:page tag or recompile the page tag to set the text to what you would like, which is what the instructions below cover. Recompiling the r:page tag that lives in the Alfresco web client JAR file isn't complicated. Assuming you already are using the Alfresco Labs 3 web application, the process should take you a half hour or less, with most of that time spent downloading and compiling code. The steps below show you how to obtain the complete source code to Alfresco, make the necessary change to the Java page tag code, rebuild the web client JAR file, then replace the existing JAR file in your Alfresco server with the newly built one. Prerequisites: You must have a Java compiler, a Subversion client, Apache Ant, and be able to use the command line. For Windows users without Subversion, you can install the SlikSVN client. Others can find a link to download a Subversion client from CollabNet's Tigris.org. The svn command will connect to the Alfresco Subversion repository and copy each of the files in the HEAD branch into your local directory. Total download size will be about 734MB. Depending on the speed of your connection, this might be a good time to get coffee, have lunch, check your email. If the Subversion URL doesn't work, check this page to see if Alfresco has changed the repository location. The PageTag.java file you want to edit is in the directory HEAD/root/projects/web-client/source/java/org/alfresco/web/ui/repo/tag. The commands below will edit the file in Notepad for Windows or vi for Unix/Mac users. But you also can just navigate to the folder and edit the file with any editor. Why this works is that static alfresco variable holds the contents of the page footer HTML (images and text), which is output by the overridden JSP tag library method doEndTag. If the alfresco variable is null, which it is the first time the code is run, the doEndTag method calls a private helper method, getAlfrescoButton, to populate it. If you want to change the footer text to something of your own choosing, or perhaps you want to retain the Alfresco copyright notice because you won't be changing the web client's look and feel, you will want either to set the alfresco variable to the text of your choosing, or edit the getAlfrescoButton method and/or some of the variables it uses to build up the footer text. If you want to keep some of the text but remove the web beacon image or SourceForge graphic, you will need to edit the getAlfrescoButton method or set the alfresco variable as discussed previously. Fortunately, the getAlfrescoButton method does not add structural HTML text to the footer, so setting the alfresco variable directly with your chosen text is a viable option. If you use HTTPS on your website and you want to use an image in your footer, have a look at the technique used in the getAlfrescoButton method to change the image URL based on the request scheme. It's a handy way to avoid having web browsers complain about an encrypted page using non-encrypted components. With the code edited, you are ready to rebuild Alfresco. Here is where you need Ant. Use the build target to rebuild the project modules. The default target will attempt to deploy the rebuilt WAR file, so make sure to use the "build" target. You will see several warnings about the use of deprecated methods and the like. But the code should build correctly. The Ant task should rebuild the Alfresco JAR files and the WAR file. The rebuilt alfresco-web-client.jar file is the one that contains the repository JSP tag you want to replace. The Ant task creates this JAR file in the directory HEAD/root/projects/web-client/build/dist. Copy the JAR file to your exploded WAR file directory location under the WEB-INF/lib directory. If you deploy Alfresco as WAR file rather than exploded WAR, you can use the full alfresco.war file that you also will find in the HEAD/root/projects/web-client/build/dist. directory. Gone is the footer from this and all Alfresco web client pages.